← Telcos and customer relationships: double or quits? In recent posts, I have (slightly laboriously!) described the basic economic underpinnings of telecoms. 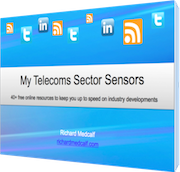 The economics of telecoms, if you will. 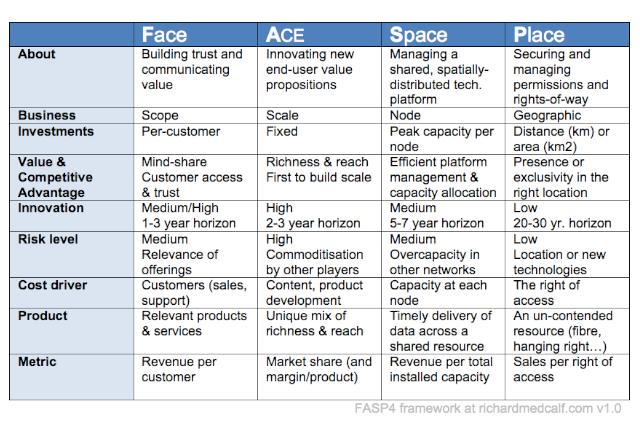 We looked at each of the four layers of the telecoms sector presented in the FASP4 framework. In this post I would like to summarise what we have found so far. The Face layer. A customer service business driven by economics of scope and where value comes from customer access and trust. The ACE (Application, Content & Experiences) layer. Highly innovative product businesses where being the first to achieve scale is critical, and where richness and reach create differentiation. The Space layer. Where “economics of density” dominate: a shared, spatially-distributed technology/compute platform (the network) must be efficiently operated to both keep utilisation consistently high and maximise revenue per unit volume. The Place layer. A slow-moving geographic business, all about physical rights-of-way to key locations, and where value comes from exclusive access to the best locations. The table shows some of the major characteristics at each layer. You can read the detailed posts for more information. The message from the table should be clear: telecoms includes at least four very different business models with different success factors, cultural and organisational requirements, and sources of value. The economics of telecoms is a multi-faceted thing. Service providers need to decide where their real value is generated, as well as where their aspirations lie. They must then manage the business accordingly. What are the implications that you see when looking at the table above? Does this help clarify tensions in the telecoms world? I would like to be on your email list. How can I access past posts on FASP4? Hi Jeremy. You should be able to sign up via the form on this page, or you can just browse the previous posts by going back through the blog. Thanks for the interest – let me know what you think!